Blustery at times and noticeably cooler. Mostly sunny with highs in the upper 40s. The weather drama is diminishing for a couple of days. Saturday afternoon was the warmest winter temperature on record in Vermont, as Burlington hit 72° at 3 p.m. By 9 p.m., it was snowing! 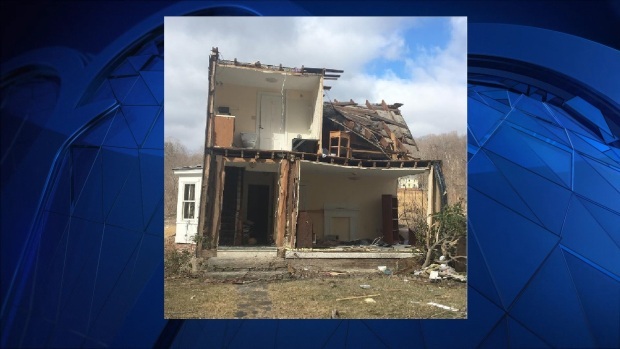 In Berkshire and Franklin counties Massachusetts, residents are cleaning up after a cluster of thunderstorms generated wind close to 70 mph with thousands losing electricity Saturday evening. That powerhouse weather front is one for the history books. Take a look at this damage a viewer sent in from Conway, Mass. We are now on the quieter and cooler side of the front. The wind gusted past 110 mph at the summit of Mount Washington, and 40 to 50 miles an hour at the lower elevations earlier in the day and is diminishing slowly this afternoon. With a good amount of sunshine we are seeing high temperature in the 30s north, and 40s south, but if you're riding up a ski lift expect wind chills close to 0°. Mostly clear tonight low temperature in the 10s and 20s central and north, to low 30s along the south coast. Sunshine tomorrow morning gives way to high thin clouds in the afternoon as a warm front approaches from the south. At the same time there's a cold front near the Canadian border with a few snow showers for northernmost Vermont, New Hampshire, and western Maine. Wind tomorrow from the west at 15 to 20 mph. A warm front south of New England on Tuesday, and a cold front to our north, will generate many clouds and a few showers, perhaps a few snowflakes in the mountains. High temperatures Tuesday in the 40s north, to low 50s south. Another strong low-pressure system will pass west of New England on Wednesday with warm and wet weather likely. Rain may be heavy at times, with a chance for thunderstorms, high temperature in the 50s and 60s. We may have another record-setting afternoon. That will be the last of the warmth for a while. A series of fronts from Canada will bring in colder air beginning on Thursday. Also several low-pressure systems will race through with the chance for snow, mixed with rain at the coast, off and on late in the week and through the weekend. At this time it does not appear we have any significant storms until perhaps next Monday and Tuesday. At that point odds will favor cold and snow. That March 6-10 cold outbreak may do a number on many of the trees and shrubs which have budded early, we may suffer another spring of frost bitten flora. March 1 is the beginning of meteorological spring time. The Vernal Equinox is Monday March 20.